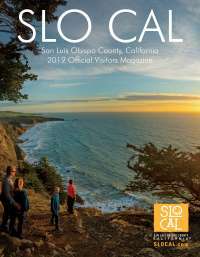 San Luis Obispo County, CA (January 12, 2017) - Visit San Luis Obispo County, the non-profit, destination marketing organization for San Luis Obispo County, has announced the hiring of the new Vice President of Marketing, Brooke Burnham. With more than ten years of tourism industry experience, Burnham will expand on current, and spearhead new, marketing initiatives for San Luis Obispo County. Her role will oversee all marketing and communications for the organization, as well as direct the contract agency relations. Burnham earned her bachelor&apos;s degree from Colorado State University in public relations and her MBA from the University of Northern Iowa. Her early career was in retail management and marketing in the tourism communities of Estes Park and Steamboat Springs, Colorado. Burnham began her destination marketing career in 2008, as the Marketing and Communications Director for the Waterloo Convention & Visitors Bureau. In 2012 she became Director of Marketing and Communications for Visit Estes Park, where she managed a strategic and integrated marketing program, including public relations, advertising and content strategy for domestic and international tourism. As the Vice President of Marketing, Burnham will work with the marketing agency of record, BCF, to introduce a new brand and create an impactful marketing campaign for San Luis Obispo County. She will also spearhead the development of the new Visit San Luis Obispo County website, to be launched in 2017. Burnham is currently in the process of hiring for the vacant positions of Communications Manager and Digital Marketing Manager. Burnham is originally from Iowa, and now lives in San Luis Obispo County with her husband and two sons, ages seven and ten. In her free time, she enjoys exploring the outdoors with her family, taking road trips and experiencing the arts. Burnham says she will be spending much of her time getting to know the Central Coast area.